DR11 HS Decor Utensil Rack - Hammered Steel. 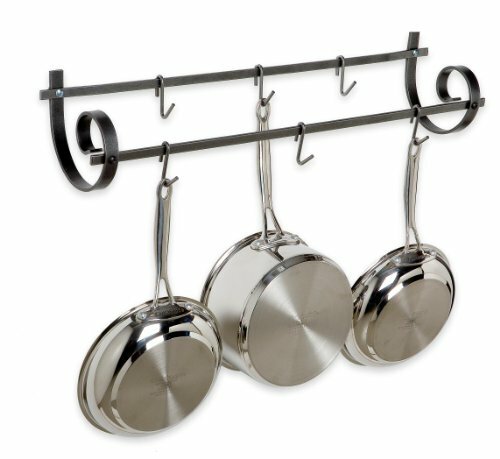 The new, compact Decor Utensil Rack adds flair to the common wall mounted pot rack. Hang your cookware, utensils, towels and anything else you can imagine! The scrolled ends resulted from fine craftsmanship meeting a decorative need in your home. Comes with 6 - DRPHS pothooks. The Decor Collection is a lighter-weight stock than our premier line, yet constructed of superior hot rolled, high carbon, steel and presented in Enclume's Signature "Hammered Steel" finish with a protective acrylic coating to deliver our expected beauty, durability and strength for lasting value and enjoyment. Fast, simple installation, with Enclume's exclusive "Toggler" anchors. Install toggler instantly in standard drywall. Holds hundreds of pounds. All hardware necessary for installation is included. Comes assembled. 5 year Limited Warranty. Hand wrought by skilled craftsmen and proudly made in the USA. Shipping Weight: 4lbs. Dimensions: 25"L x 5"D x 6"H.